In yet another first, ApnaComplex now has ability to conduct “Surveys” and gather detailed feedback on any aspect related to the society. Surveys offer ultimate flexibility for Committee Members to carefully consider various opinions in the community. This feature is available to all our users including the Free edition users. Administrators can create a Survey with a title, detailed description which will be presented to the survey respondents. While creating, admins can also select the respondent category such as owners, residents or admins and set dates for survey validity. Once survey is created, admins can proceed to add any number of questions to the survey. Questions can be of different types such as multiple choice questions, text based questions and the user can be asked to select only one or more among the options provided. Questions can also be marked if it is mandatory to answer them before proceeding to next questions. While creating the Survey, administrator can make the Survey a ‘Secret’ where the respondent’s details will not be revealed. Also, admin can chose to publish the results to every one OR only to the administrators. Once all questions are added, admin can publish the survey for members to respond to along with an expiry date for the poll. 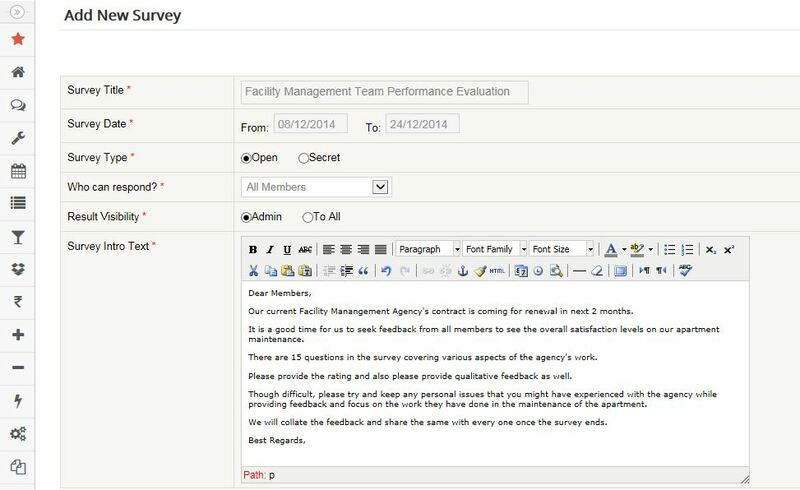 Respondents can answer the survey questions, go back and modify them before finally submitting them. Admins can view the response reports wen they wish when the survey is in progress and also download the response summary as excel. How is Survey different from Polling Booth? ApnaComplex has Polling Booth since beginning. Polling Booth primarily offers a mechanism where members can “vote” on a particular question and indicate their choice among the various options listed. Its not possible to collect verbatim feedback in polling booth. It is to be used for something such as ‘Election’ or for voting for an AGM resolution etc. What are you waiting for? Go to Forums->Surveys and start your first survey! Kudos to AC team for listening even without words being spelt and implementing the features. SURVEY would prove as a fantastic tool and empower the committee in taking up sensitive matters to arrive at an effective solution to complex issues. Incidentally we launched the services of AC yesterday in our complex in the presence of Raja (Co-founder 0f AC).. Thank you Mr. Ram. Yes, what you listed is the core value of Survey. Survey should assist committee members to listen to residents more effectively to solicit or arrive at solutions. Congratulations on the launch and welcome to the family! Sounds good Am going to try it out & revert. On a different page; in Polls is there an option to limit only Registred Owners to vote? In elections or other issues for Polls where ONLY one vote per Dwelling Unit is Valid and co- owners can not vote except physically by prior authorised Proxy; such measures are a must! Good luck to Team Apna Complex! I am a staunch supporter as President of my Residents Welfare Maintenance Society. The site is definitely a good management tool! Thank you so much, Col. R N Banerjee. Regarding polls, yes you can restrict the votes to only one per dwelling unit and only to Registered Owners. You can even restrict defaulters from participating in a poll. If you need any further assistance, please reach out to support [at] apnacomplex.com with your query.